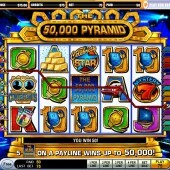 It is always a brave developer that takes on the task of recreating a popular television or movie franchise into a slot game and IGT has pulled off one heck of a job by releasing the slot version of popular television hit series 50,000 Pyramid. This slot release is a 5 reel, 15 payline title that was released way back in 2006 when online slot gaming was really still in its infancy. The graphics and gameplay might not come close to competing to some of the innovative slots that are out today but a bit of perspective is required to remember that back in the day this slot was ahead of its time. Granted, online slots did not exactly come in the form of games that had the same 32-bit power as Paperboy on the Mega Drive but this slot was released at a time when online slots gaming was very much in its infancy so the aesthetics should be put to one side when making a modern day judgement call. The graphics are not to the level of some of today’s modern releases such as Sheriff Gaming’s bank heist themed Amsterdam Masterplan or Betsoft Gaming’s gangster themed The Slotfather but this game has more than enough in its locker to hold its own against the more recent slot releases. Regular symbols during the game play of 50,000 Pyramid include the Mystery 7, Gold Bars, Celebrity Star, Contestants, Ace, King, Queen, Jack and 10. All of these symbols will award a payout if at least three of them appear on an active pay-line. The Wild symbol is represented by the 50,000 Pyramid Logo and substitutes for all other symbols except for the scatter symbols to complete winning combinations. The main bonus feature in 50,000 Pyramid is the Winner’s Circle Pyramid Bonus feature. This feature is triggered if you hit three or more of the Winner’s Circle scatter symbols across the reels. You begin the feature with 2 free spins and a 1x multiplier. You then have the chance to expand on these with five picks. You must then choose one of the segments on the lowest layer of the pyramid displayed on the screen in front of you to reveal an extra free spin, additional multiplier value, extra pick or an arrow symbol directing you to the next level of the pyramid. You continue to pick segments until you reach the top of the pyramid or run out of picks. You are awarded with the total number of free spins you won in that feature and you then add the multiplier you earned in that bonus feature to your prize winnings at the end of the free spins. 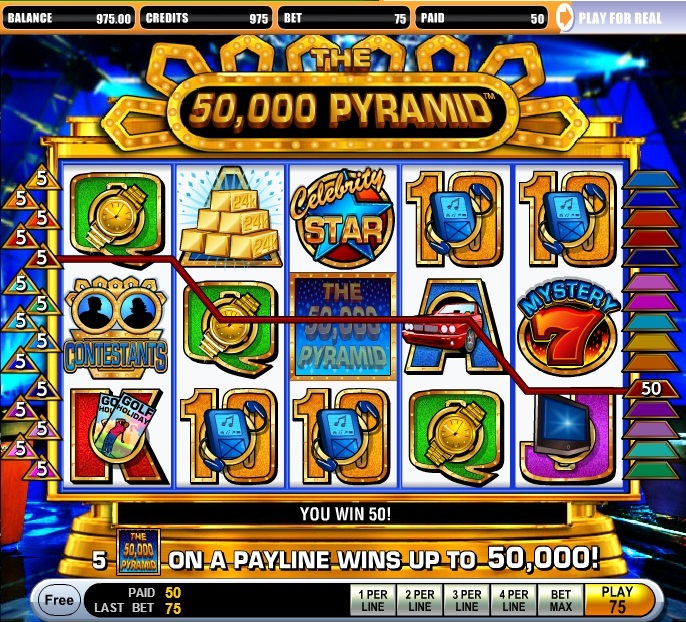 50,000 Pyramid is a classic online slot game that has survived the test of time and still remains one of the most enjoyable slots out there. It has a nostalgic feel to it and the bonus feature is one of the most enjoyable around. If you enjoyed Real Time Gaming’s other releases such as the Egyptian themed Cleopatra’s Gold then you will love this slot.